I love watermelon, like so much that I could eat entire melons by myself every summer. I love it when you cut it open and its bright red and you just know that flavor is going to taste like summer in your mouth. 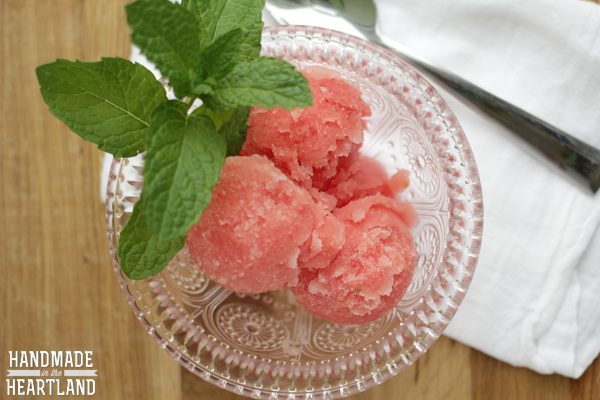 mmm… I’ve decided i’m going to do a lot of watermelon recipes for you this summer, so get ready. 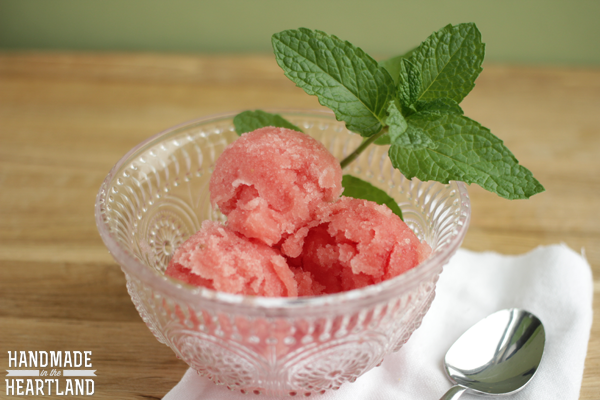 😉 This first one is a delicious fresh watermelon & mint sorbet. Its SO easy, promise. Do you have an ice cream maker? So a few years ago I was given the KitchenAid stand mixer ice cream maker attachment, its really the easiest way to make ice cream if you have a KitchenAid already. I love that I don’t have to have a huge additional appliance and it just lives in my deep freeze in the garage so whenever I’m ready to whip up some fresh ice cream or sorbet its ready to go. 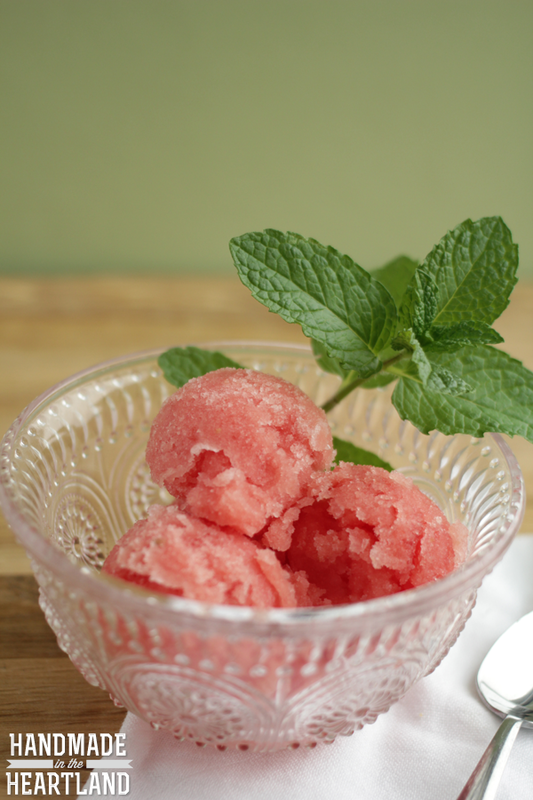 Making sorbet is so easy, all you do is puree your fruit and then make a simple syrup. I like to infuse my simple syrups with herbs to add an extra layer of flavor. I’m actually not a huge mint fan but I jut had a feeling this would be a good combo and it turned out perfect, with just a hint of mint. First make your mint simple syrup by combining the water and sugar in a saucepan over medium heat. Stir until the sugar is dissolved and it comes to a simmer. Remove from heat and add the mint leaves. Let steep for 20 or so minutes and then remove the mint leaves with a strainer. Refrigerate the simple syrup until completely chilled, a few hours should be enough. Prepare your watermelon by pureeing 5 cups in a blender and then put it in the fridge to chill for a few hours. You want both the simple syrup and the fruit to be completely cold. 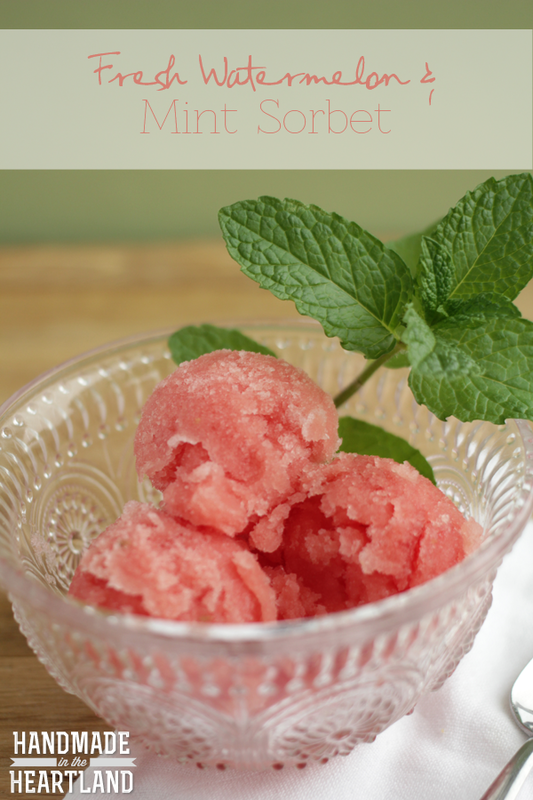 In your ice cream maker process 1 1/4 cups of the simple syrup (you will have some left over) and the watermelon until you are happy with the consistency, in the KitchenAid attachment its about 10 minutes. After processing put it in the freezer for a few hours before serving. Enjoy! Whats your favorite way to eat watermelon other than just eating it strait out of the rind? 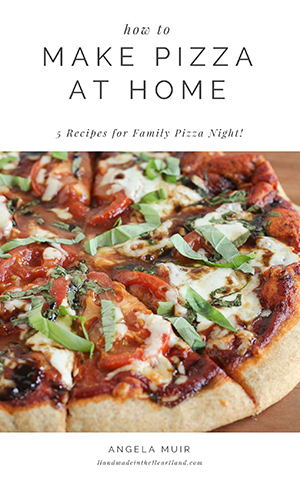 I’m working on a few salad recipes and a watermelon drink to share with you. I’d love to hear your ideas!